This is because it is SELF FERTILE and can be planted by itself and still produce apples. This means you can pretty much plant these where ever you like. Usual exceptions apply such as submarine window box and active volcano orchards. Red Devil (Malus domestica 'Red Devil') was introduced in 1979 and is the result of crossing the apple varieties Discovery x Kent. Apparently named after the Red Devil parachute team so if your apples start packing a chute and heading off towards a plane, you will know why. An outstanding garden apple variety with a deep scarlet skin and red stained flesh when fully ripe making it fun apple for the kids especially. Expect the juice to be an unusual pink colour. The Red Devil apples are particularly good for juicing. Compared to many other apple trees, the Red Devil has a higher degree of disease resistance giving you less problems in the longer term. We mean tree disease, not the Ebola virus and such like! Expect a high yield of apples from the Red Devil, this is another one of the reasons it is a popular apple tree. As you would expect with lots of apples, before comes lots of flowers which attract the local wildlife. This is usually the flying kind, not the mobile transport, benefit claiming, read your fortune kind. 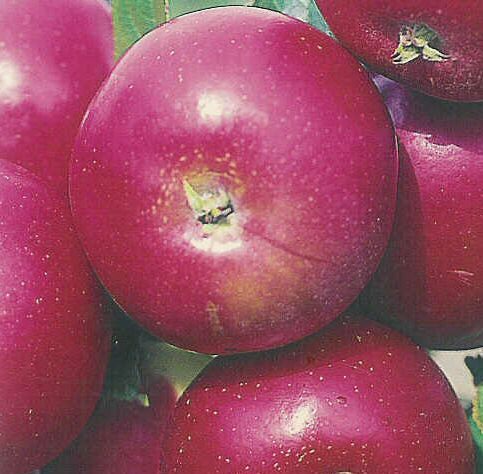 The Red Devil Apple is considered a good choice for growing in a container. We should elaborate and say suitable container as there is bound to be someone out there that will try and grow it in a margarine tub and complain about lack of performance. Self-fertile/Not self-fertile: This apple is self fertile, so there is no need for an additional apple tree to ensure pollination. This apple is in flowering period is C3 and will act as a pollination partner for other apple trees in C2,C3 or C4 flowering periods.